Kunzite is the pretty pink, most popular, and commercially important variety of the spodumene family, cousin to hiddenite (green spodumene) and triphane (yellow spodumene). Due to its strong pleochroism, kunzite has to be oriented particularly and cut carefully in order to achieve the deepest tone and saturation, as the stone's best color is seen when looking down the length of the crystal. Stones of 10 carats or larger display kunzite's pastel hues best, though it can be found in quite large crystals over 1,000 carats. refractive index, birefringence and fluorescence. Biaxial common point is 0.006 from high RI. 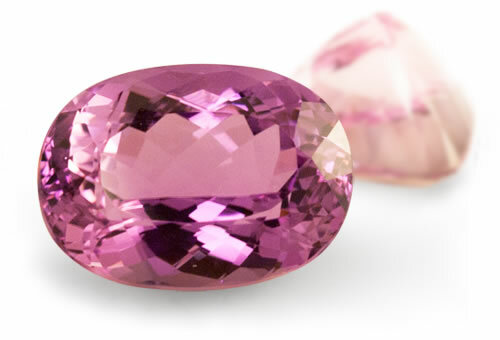 Color may fade in some kunzite upon exposure to sunlight. Stones often have deep pavilions to improve color. Kunzite is a type I clarity stone. Kunzite sometimes has growth and etch tubes, healing cracks, liquid and multi-phase inclusions.